BIRMINGHAM, Ala. (June 19, 2018) - Outfielder Zach Gibbons from the Mobile BayBears, the Double-A affiliate of the Los Angeles Angels, was named the Most Valuable Player of the Southern League All-Star Game after his standout performance Tuesday night at Regions Field. Gibbons entered the game in the sixth inning and went 3-for-3 at the plate with four RBIs and three runs scored. His single in the seventh inning was the first of the game for the South Division, and it opened up a scoring barrage over the final three frames. The squad plated nine runs on 10 hits to earn a 9-5 victory over the North Division. In the eighth and ninth inning, Gibbons hit a pair of two-run singles. The eighth-inning single gave the South a 4-2 lead at the time, and his ninth-inning base hit drove in a pair of insurance runs. Gibbons scored all three times he reached base. 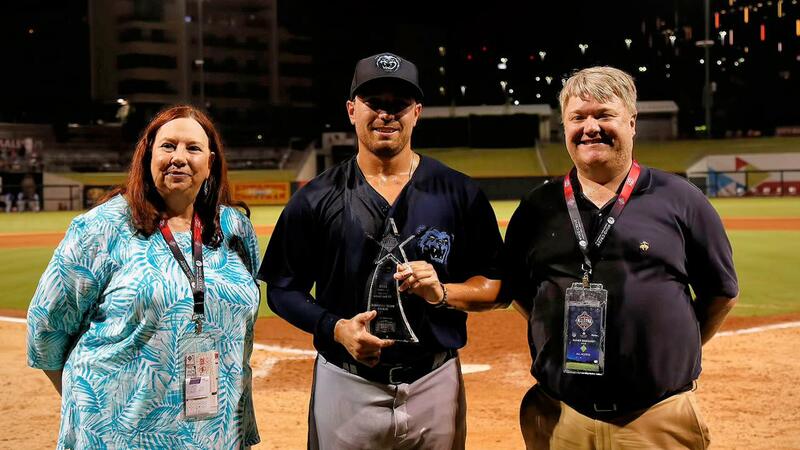 Gibbons became the first BayBear to be named the Most Valuable Player of a Southern League All-Star Game since outfielder Justin Greene in 2013. Right-handed pitcher Matt Custred struck out the one batter he faced, Zack Collins , to end the sixth inning. The BayBears open the second half with a six-game home series against the Tennessee Smokies beginning Thursday at 6:35 p.m. CDT. Live coverage can be seen on MiLB.tv (subscription required, promo code: BAYBEARS) and heard on the BayBears Broadcast Network, the TuneIn Radio App, and the MiLB First Pitch App, with the Countdown to First Pitch starting at 6:15 p.m. The BayBears host a total of 70 home dates through Labor Day, September 3. Single-game tickets and ticket packages are currently on sale. Group and hospitality offerings for the 2018 season can be reserved by calling (251) 479-BEAR (2327).